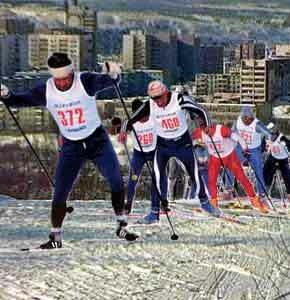 Enthusiasts for Cross-country Ski Marathon Murmansk - Prazdnik Severa - look here! On the first Sunday of April the cross-country ski marathon for well-trained skiers starts as part of the Northern Festival named "Prazdnik Severa" in Murmansk. 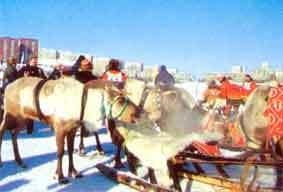 This is a combined holiday of programs KTCS04 Ski tour in Khibiny Tundra as preparation on the tour KTCS11 Murmansk Ski Marathon 2011. Join and win the First Price! Day 1, Saturday: Arrival in Murmansk airport. Transfer to a hotel in Monchegorsk (140 km). Check-in, dinner in Russian café and overnight in the hotel. Day 2, Sunday: Breakfast at the hotel. This day we train and try-out our equipment in the surroundings of Monchegorsk close to Khibiny Tundra. Lunch during skiing day. Distance of skiing: 20 km (or more, if want). In the afternoon we will have a Russian shashlik party in the forest. Overnight in the hotel. Day 3, Monday: Breakfast. Today we will meet our snowmobile guide whom takes care for luggage transport and we start our ski-tour with crossing Imandra Lake towards Khibiny Tundra to a small village named Imandra Station. Overnight in a country house in more person room. Distance of skiing: 25 km. Day 4, Tuesday: Breakfast. We continue beside the foot of the mountains and change the lake area for a beautiful forest landscape. After a campfire lunch we will come in a valley which leads us to the centre of Khibiny Tundra. Dinner and overnight in a small wilderness hotel surrounded by mountains. Distance of skiing: 30 km. Day 5, Wednesday: Breakfast at the hotel. First we ski to eastwards to have a beautiful view on the forest valley and then we ski through the valley to the South. Campfire lunch during tour. Dinner and overnight in Sanatorium Health hotel in twin room with shower and toilet. The evening can be spent with the additional services of the SPA; special showers, massage and other healthy and medical services. Distance of skiing: 25 km. Day 6, Thursday: Breakfast. We continue our way westwards. Today will be the summit of the ski-tour! We ski through valleys to the famous Ramzai Pass, a cleft with high steep walls. We will ski in the desolate white world of snow plateaus surrounded by the highest mountains of Khibiny Tundra. Campfire lunch during way. Later we ski over the lake with lots of islands on the foot of the mountains. We stay overnight at the Tourist Base in Kislaya Bay in small wooden houses. Distance of skiing: 40 km. Day 7, Friday: Breakfast. Transfer to Murmansk and check-in at the hotel. Lunch on your own in the hotel. At 2 PM a guide comes to the hall of the hotel to pick you up for excursion in the city and a harbour. Visit to the Naval Museum with its photographs, artefacts and models of the Northern Russian Navy. In evening a skating possibility in the Ice Palace. Dinner on your own in the hotel. Overnight at the hotel. Day 8, Saturday: Breakfast. Training on the ski tracks close to the city in the morning. Pickup the start documents. Watching a reindeer racing competition or ice swimming competition on Semyenovskoe Lake which starts around 11 o’clock. In evening a skating possibility in the Ice Palace. Overnight at the hotel. Day 9, Sunday: Breakfast. At 11 o’clock the ski Marathon starts. The guide brings you to the place and later will pick up to bring you back to the hotel because it’s quite long distance. The same day Lappish Games are in the same sport pot. In evening – a festive rewarding ceremony of winners of the Marathon on the central square. Overnight at the hotel. Day 10, Monday: Departure. Transfer to Murmansk airport by taxi. • Excursion to Ship museum. • The travel to Murmansk. • Participants need to bring own cross-country ski equipment, sleeping-bag. • An equipment list will be provided at booking. • Taxi von Murmansk Zentrum zu Murmansk airport: EUR 15,-- per taxi.